Summary: How to Format SD card properly on Windows 7, 8, 10 or on Mac is quite a thing when buying a new SD card or sometimes we would like to format the memory card to free the space. In this article, we will discuss what does formatting SD card do and how to format the SD cards wither certain methods, and even when it says SD card is write-protected. We will also provide a quick step-by-step procedure on how to carry out data recovery in advance. SD Card or Secure Digital is popularly used in portable devices such as cell phones and cameras; it is an ultra-small flash memory card with relatively high capacity memory. Latest digital cameras and video camcorders, smartphones, audio players, computers and other portable devices now can load 64GB SD card or Micro SD card as a storage medium to store cherished photos and treasurable memories that you want to keep for good. Then how to format SD card properly and why we should perform formatting on SD card? Then you may read through below contents to get an idea. What Does Formatting SD Card Do? [block]8[/block]Format SD card by using Diskpart/Also Good on Fix SD Card Corruption Error. Can’t format the SD Card? Plug SD card to another USB port. Try to another PC or a different operating system. Update the USB device driver. Use CHKDSK to check your SD Card Errors. How to format SD card write protected on Windows 10? How do you format an SD card on a mac? It is no longer a new issue when SD card is attached to a computer and it seems to be corrupted or virus infected, then reformat SD card is a quick fix to resolve the problems. One thing to consider then is the target environment where needs to insert the SD card. Is the file system compatible? To make the SD card visible on the system, it’s better to format SD card with proper file system e.g. FAT32 before using it to a specific device. Thus, to erase the SD memory card properly, we are listing 4 methods for you to take reference. 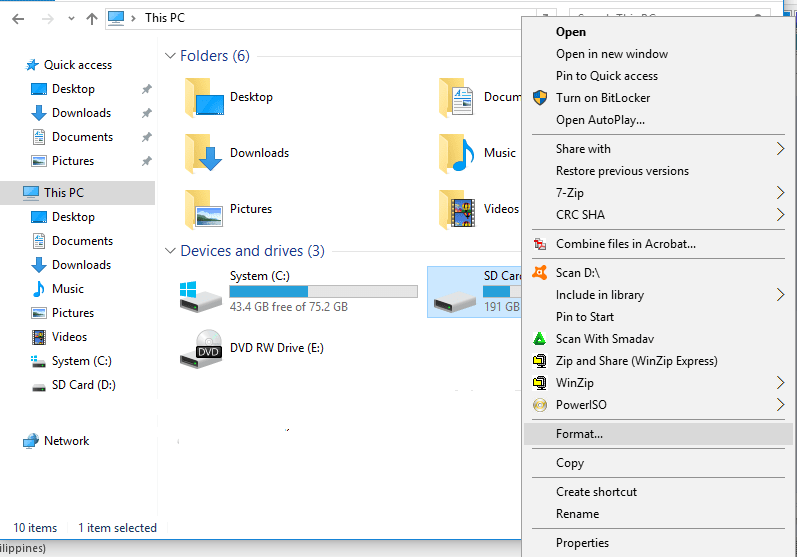 Connecting your SD with the computer and then click “This PC” on the desktop, after that right-click on the SD card and choose Format from the popup menu. Choose the File Format as FAT32 and tick “Quick Format”, and then click Start. You’ll receive a WARNING: Formatting will erase ALL data on this disk. Don’t worry, if you are willing to format after buying a new SD card, you can click OK to continue. And the system will format the SD card in a short time and informs the result. Press Win+R and type “diskmgmt.msc” in the window, a Disk Management window pops up after clicking OK. Right-click the SD card and choose Format, you can choose the file system and tick perform a quick format to let the system format the SD card. CMD is short for Command Prompt, and the users can type the DOS command to format SD card, simply press Win+R and type “CMD” in the window, then a DOS window pops up and you just need to type”Format F:/q” to perform a quick format. Enter “Diskpart” in the window and then enter “List Disk”. Enter “Select Disk 1”, if your SD card is disk 1. Otherwise, change 1 to another number. Type “Clean” in CMD window and then press Enter on your keyboard. After that, type “format fs=fat32” to let the system starts formatting SD card. When using Windows Explorer to format the SD card, sometimes we may encounter an error “Windows was unable to complete format SD Card”. What is that and why? Then you should know some signs of SD card corruption to take notice. Files disappear. You might discover one day that some files are missing. The cause might be a file system error. Receives SD Card errors. Example of this is “access is denied”, “card not formatted”, “you need to format the disk before you can use it”, and “RAW” status in disk management. SD Card unrecognized by the device. Example for this is when you insert SD card to a PC thru card reader and it is not recognized. Cannot Read SD Card or Write-protection. When this happens, you will be unable to make any changes. This is another indication that the SD card is corrupted. Unknown files in SD Card. You might get shocked when your files are missing but it is more shocking when unknown files appear in your SD Card. This might be a virus or malware. Show 0 byte. SD card shows empty. Your SD card might be suffering from virus infection or errors in the files system. Thus, with the above-explained reasons, you may encounter the SD card corruption problem, to fix the problem properly and make SD card visible again, you are having 6 solutions to give a try. If the current USB port can make SD card visible on your computer, and try to change to another USB port. If you are having Windows PC and cannot detect your SD card, try to connect to a Mac or Linux computer, or change another Windows PC to give a try. Enter into Disk Management and right-click on your SD card, choose “Change Drive Letter and Path” and assign a new drive letter to make it visible again. Enter into Device Manager by typing” devmgmt.msc” in the Win+R window, and then choose “Update Driver Software”. Right click on the Start Menu and select Command Prompt or type “cmd” and Enter to run it as administrator. Type “chkdsk drive letter:/f”, (find the assigned drive letter of your SD Card), then click Enter. The windows will start repairing errors and damaged files. Insert your SD card again and check if your SD card visible again in This PC. Right Click My Computer or This PC and hit Manage. Click the Device Manager and double-click Disk Drives and right-click your SD Card. Eject your SD Card, restart your PC and insert again your SD Card. Check if your PC detects your SD Card. And when you encounter windows cannot format micro SDcard error, you can also use Diskpart to fix this problem (Return to Method 4). In the Start button click Command Prompt (Admin) or type “cmd” in the Search Windows. Right-click the Command Prompt and select Run administrator. In the pop-up window, type “diskpart” then “list disk”. A list of disks connected in your PC will be shown. Type “attributes disk clear readonly” then type “clean”. This portion is to remove the write protection. To end the process, type “exit”. Go back to the previous method presented. If you are using Mac OS and willing to know how to format SD card, here is the method for you to take reference. Step 1. Insert SD Card to your PC and through a card reader. Step 2. Go to Disk Utility. On the top right corner of your screen, click the magnifying glass. In the search box, type “disk utility” and open the app. Step 3. Find your SD card assigned with No Name or Untitled. Click the Erase tab. Step 4. Click the Format. Select the proper file system: if the SD card is 32 GB, choose MS-DOS (FAT), if 64 GB SD card, choose exFat. Step 5. A prompt message will pop up. Click Erase. Then your SD card is successfully deleted. What if you have vital photos, documents, videos you need urgently that you don’t want to lose, and after checking disk management, you can still find your SD card in the list, then there’s no need to format SD card, on the contrary, you can try using third-party data recovery software to recover data for you. Before anything gets worse, prioritize your valuable photos, videos and other data in your SD card before proceeding to format. Important Note: as long as the SD card is not physically damaged, stop using the memory card before running it to data recovery. And here we strongly recommend you to download and install Bitwar Data Recovery for Windows or Mac, keep it installed on your computer and once finding data loss, it can help recover your precious data at the very first time. The error issues about SD card has been popularly discussed by users which usually boils down into file system incompatibility. Meanwhile, SD card corruption is the main cause which leads to a decision of formatting. This is to get rid of virus or malware programs and enhance the work performance of your SD Card, as long as the SD card is not physically damaged. Always make sure that you can still keep your precious photos, videos, and audios from your SD card with the help of Bitwar Data Recovery BEFORE the format procedure. What to do When SD Card Not Full but Says Full? Check This out! Great thanks, needed this info ASAP, also thanks for the customer support, very nice how fast you helped me and sorry if it was a silly question. Good luck to all, and thanks again. Such an important information! Thank you very much, came here looking for something like this. While formatting it asks me which type of file system, FAT32, NTFS or exFAT, which one should I use? I think that doing this step wrong is what has been bringing all those issues to me, thank you! Hi, Cameron, it depends on what device you are using to read this SD card? Phone or camera? Get content updates in your inbox for FREE. Copyright © 2018 R-Datarecovery All Rights Reserved.